Photo Galleries Last Night of the Proms IT Schools Africa Update...... Purple4Polio the results! Cliderhow - The Club's Weekly Bulletin Flexible Rotary - report of meeting on 29 May Rotary 2 - "Flexible Rotary" Presidential Handover 2016 - 17 Thank you Julie! Youth Service New Year PHF's District Council Meeting Clitheroe Food Festival 2018 Skydiving challenge.... Bonfire Committee President Frank's Valedictory Meeting Clitheroe Community Bonfire 2018 Bill’s Big 542 in 2016 Challenge for Cancer Research UK Rotary at Work in the Ribble Valley Community Service Rotary 2 Video links District Council Meeting Rotary Bowling at Waddington Club. Youth Speaks update Mary has a ball! Sports Rotary Golf Day 2018 IT4Africa Purple4Polio Life Education Spring Clean.... International Purple4Polio Rotary Grand Tour District Council Meeting Rotary Golf Cheque Presentation 2018 Young Chef 2019 President Mary hand over the cash and her chain! National Rotary Day/Thanks for Life New Year's day @ Clitheroe Rotary Booths Supermarket Collection 2018 Club Newsletter Foundation The Beetle takes shape More Community Service in Clitheroe Pounds for Polio Three new Paul Harris Fellows World Polio Day 2017 Castle Bandstand get a Rotary makeover Purple4Polio comes to Brungerley Park! Around the Schools with the Purple4Polio exhibit. Fund Raising Blood Pressure Awareness Day 2018 85th. Clitheroe Rotary Birthday Party! Smalls for All - Pants to Poverty! Club Service Two New PHF's Training Page Bonfire cash distributed. Purple4Polio at Clitheroe Market! Club Council Update from Flexible Rotary Fifty Years a Rotarian! Technology Tournament 2019 Membership & Membership Development Young Musician 2017 Rotary Fellowship Exchange 2016 Litter pick Life Education at Christmas! 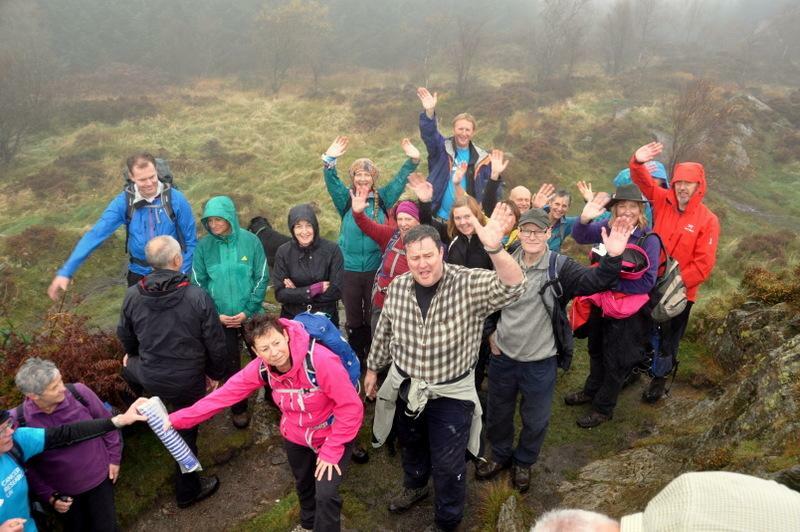 Bill reached his 542nd and final summit Saturday, 29 October. Members will no doubt have noticed the absence at most of this year’s meetings of Past President Bill Honeywell BEM PHF. 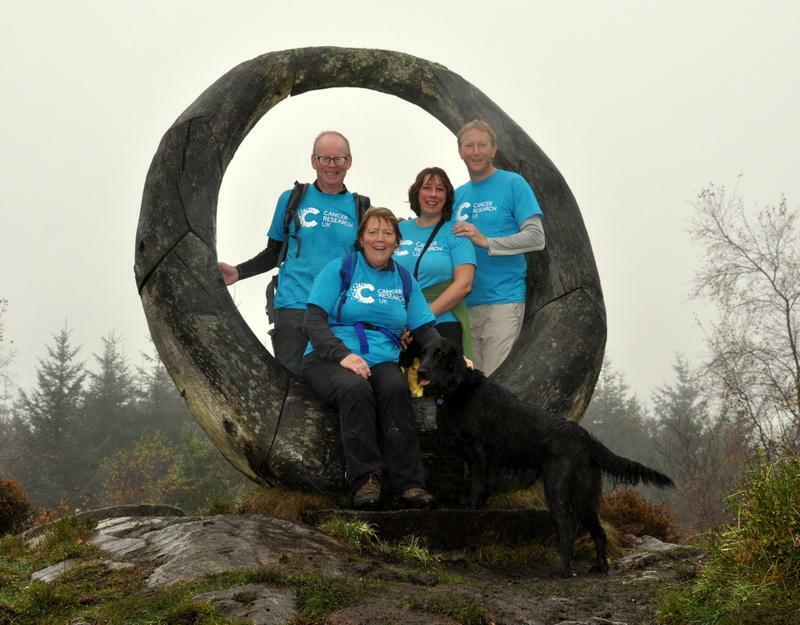 It probably hasn’t escaped your attention that he’s been engaged on another of his ‘jaunts’, otherwise known as Challenges, in an attempt to raise funds for Cancer Research UK. 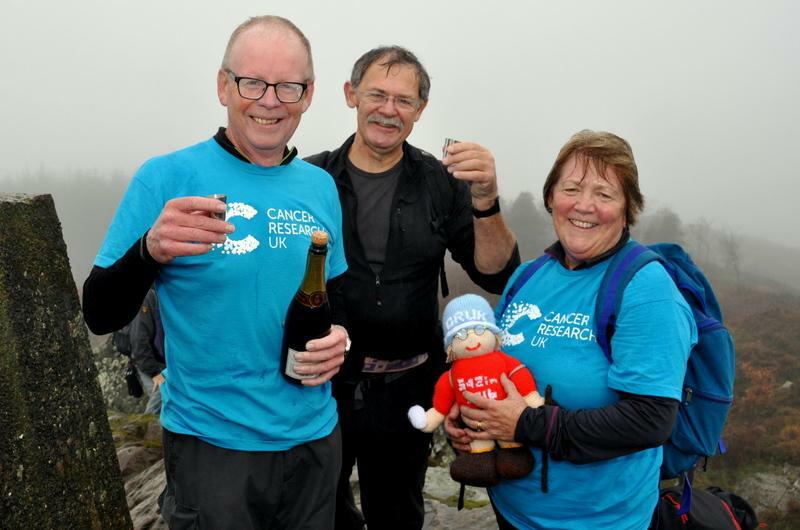 After 86 days spent on the Lake District fells, many of them alone (no comment required), Bill reached his 542nd and final summit Saturday, 29 October. 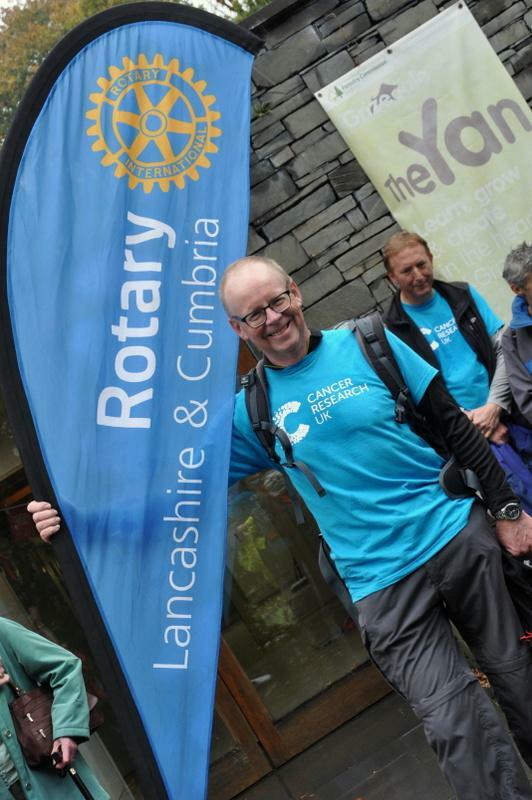 On this occasion he was anything but alone, as around 60 people including Rotarians (from Clitheroe, Ribblesdale, Church & Oswaldtwistle and Accrington), friends and family were there to enjoy the party atmosphere. 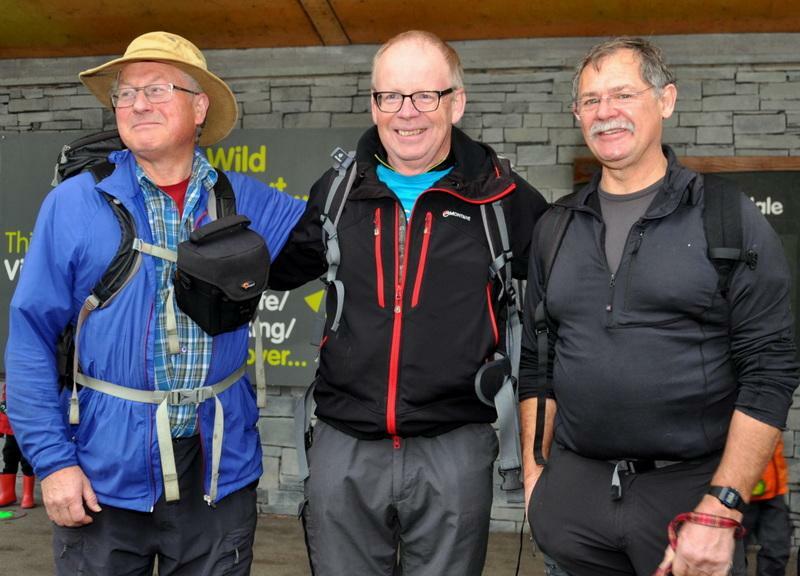 There were even famous people among the walking party, including guide-book author Mark Richards and the man responsible the eponymous summits, Bill Birkett. 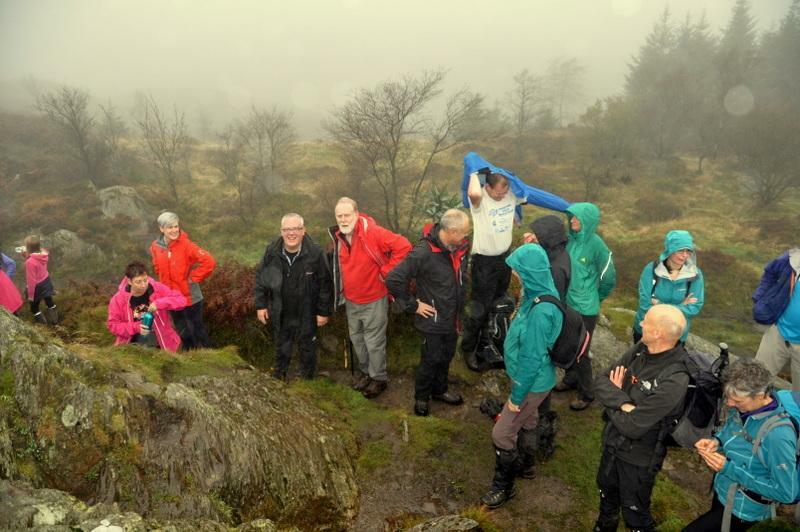 Although cloud and drizzle presided over the weather, it was mild and calm, and the party enjoyed the autumn colours and good conversation as they walked to the summit of Carron Crag, where David Evans produced a bottle of champagne and congratulations were made. 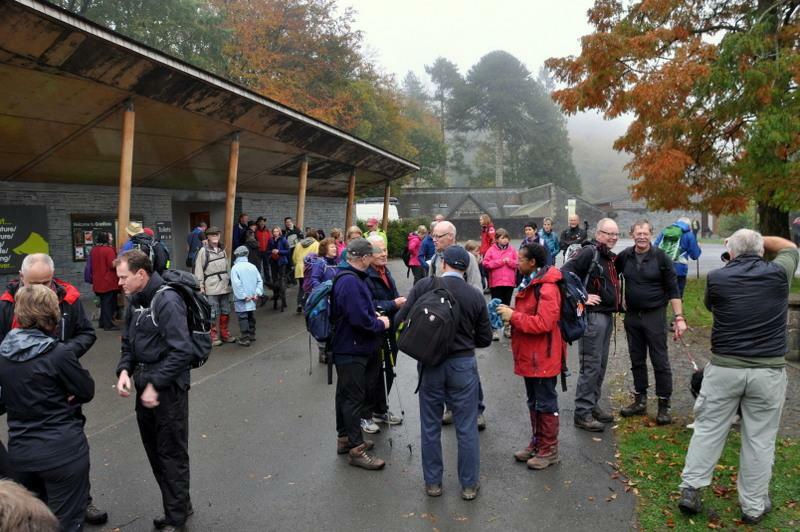 Back at the Grizedale Visitor centre we were joined by Miles & Lynda Leadbeater (and eventually rejoined by one or two Rotarians who’d taken a wrong turning on the way back!) – free refreshments were kindly provided courtesy of the Visitor Centre and Bill made a short speech, mainly thanking Val for her incredible patience. 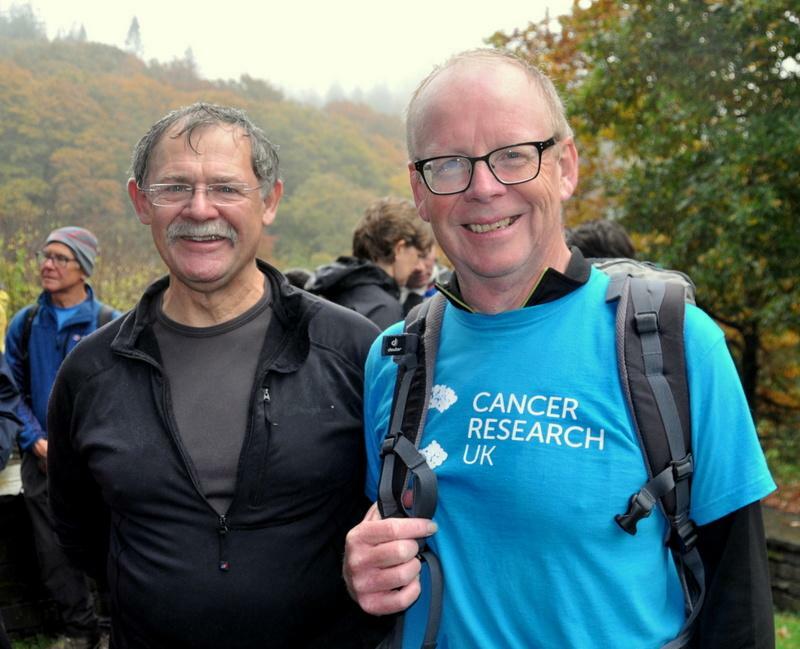 For those of you who like statistics, since 14 January 2016 Bill has climbed 542 summits - including all the 214 ‘Wainwrights’ (for the second time); walked 750 miles; climbed almost 225,000’ (42 miles, or the equivalent of climbing Mt Everest from base camp 19 times) and would probably have worn out his boots if he hadn’t decided to alternate two pairs! He says he’s not prepared to discuss his fuel bill!